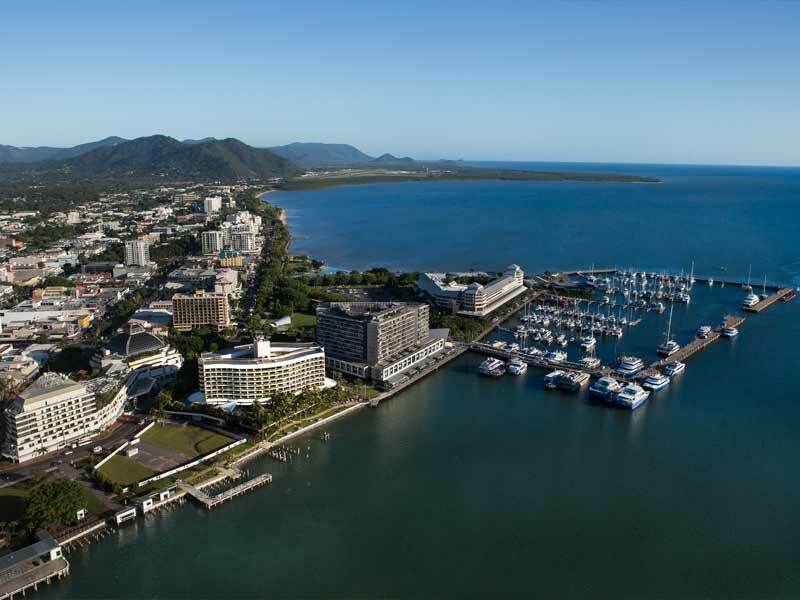 Situated in the heart of the city, the Hilton Cairns is located on the picturesque waterfront overlooking Trinity Inlet. With luxury accommodation offering water views, deluxe amenities, central location and 5-star elegance and comfort, there is no better option for your holiday in Queensland. The elegantly-appointed guest rooms and resort facilities are designed with your comfort and convenience in mind, so rest assured knowing everything you need you need for the ultimate Tropical North Queensland holiday is right at your fingertips. 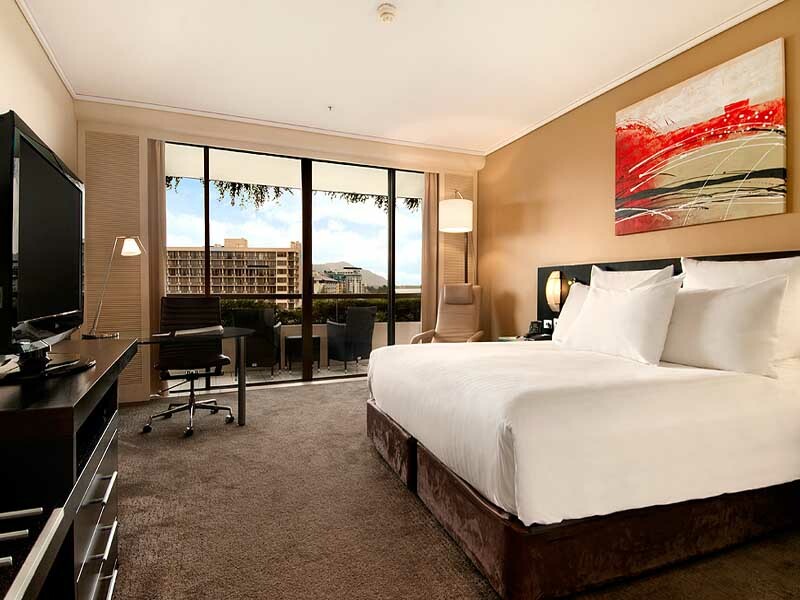 From the guest rooms through to the suites and executive rooms, it’s not hard to unwind in the total comfort of the Hilton Cairns rooms. You can relax on the private balcony and take in the sweeping views of the cityscape, tree-covered mountain ranges, Trinity Inlet and beyond; Feel confident that your belongings are safe thanks to the audible alarms, electronic lock and in-room safe; Enjoy the convenience of Hilton Cairns in-room amenities and services such as 24-hour housekeeping, internet access, auto wake ups, newspaper deliveries and more. 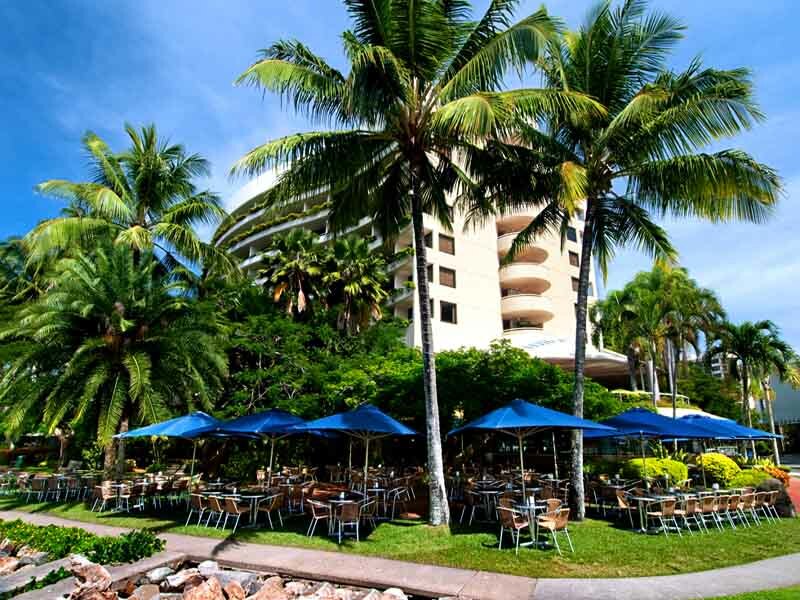 Dine in style at the range of restaurants at Hilton Cairns. Start the day with a sumptuous breakfast from the à la carte or buffet options at Café Sunrise. Look out over Trinity Inlet as the midday sun sparkles on the water while you sink your teeth into a signature sizzling fajita at the award-winning Mondo on the Waterfront. Say ‘Ciao’ to the huge selection of traditional Italian dishes, from pizza to all kinds of pasta including gnocchi, Bolognese and linguini, when you sit down for dinner at Simply Italian. After your tummy is content, wash it all down with a classic cocktail or alcoholic/non-alcoholic beverage from the classy Six Degrees Bar and Lounge that overlooks Trinity Inlet. You’ll barely find the need to go past the resorts front door with the selection of facilities on site. Families can holiday with ease with scheduled children activities and babysitting services available, as well as the opportunity to add cribs to your room. Fitness fanatics will find their gym away from home in the Hilton Fitness Room and Health Club. 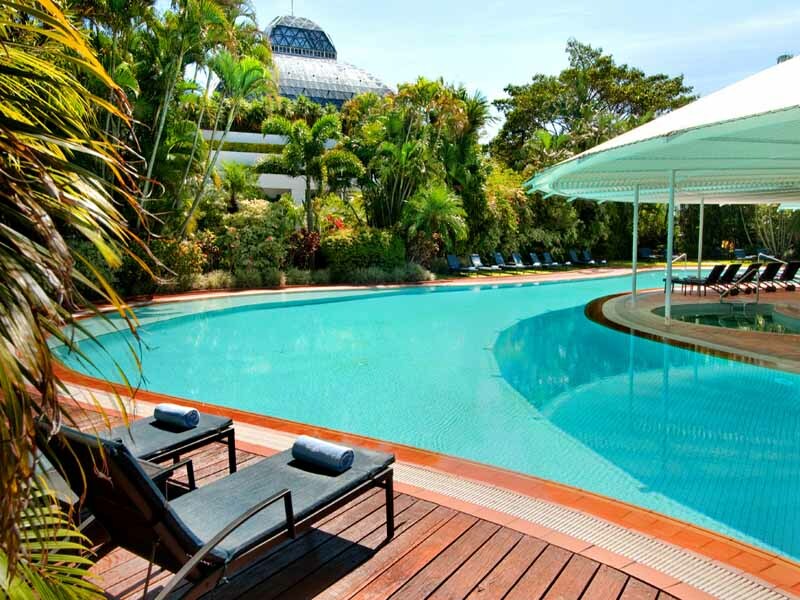 Visit the gift, take a dip in the swimming pool, kick back in the lounge, make use of the business facilities or visit the tour desk for all the opportunities around Hilton Cairns! 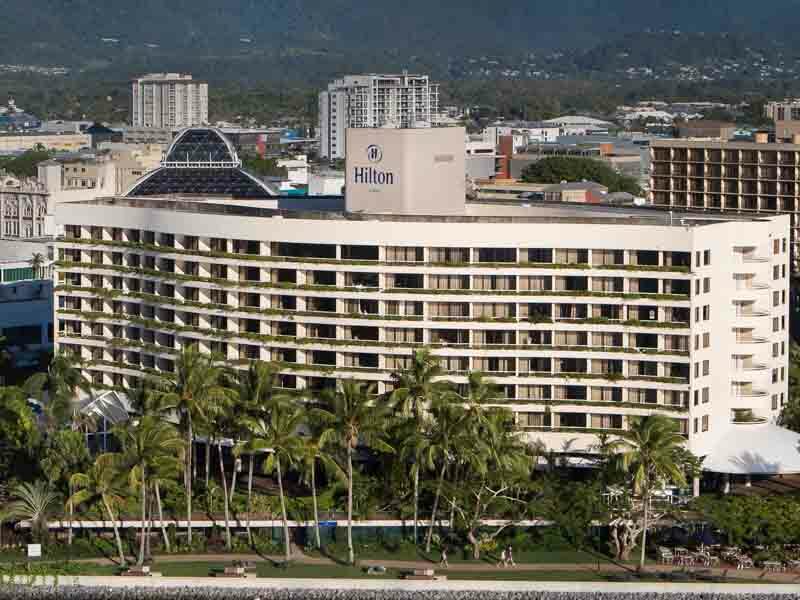 Why go to Hilton Cairns? You’ll find Hilton Cairns on the waterfront of Cairns, surrounded by luscious greenery. The prime location will get you there in less than 15 minutes from the Cairns Airport and provide easy access to the best of Cairns including close proximity to Reef Fleet Terminal, Cairns Convention Centre and the food and shopping district of the city. 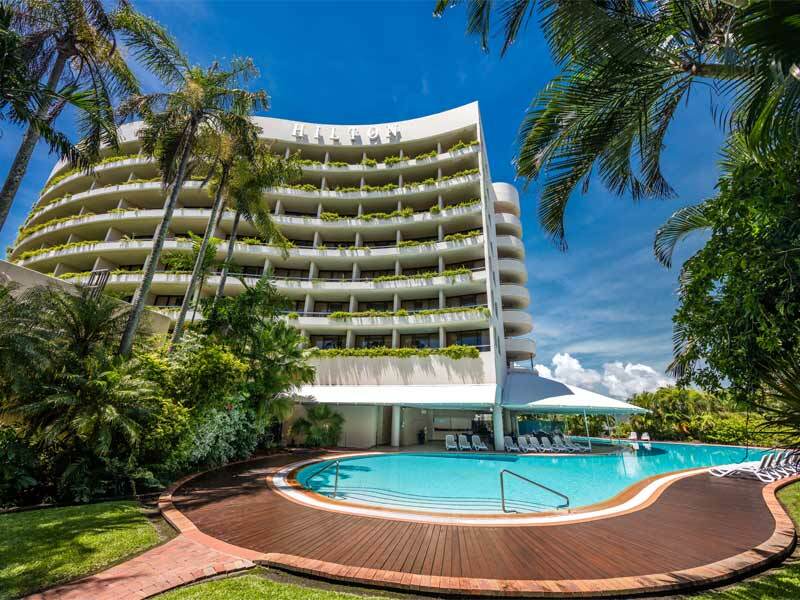 The excellent location combined with the elegant accommodation, state-of-the-art facilities, award-winning dining and luxurious Hilton touches make Hilton Cairns the ultimate destination for your Queensland holiday. Enjoy the comfort of 30sq. metres of space in the Hilton Guest Rooms. These rooms feature sweeping views of Cairns cityscape, the mountain ranges and rainforest from the private balcony. Choose between a king size or twin bed set up to suit your travel party. The rooms are complete with a range of amenities such as air conditioning, TV with on-demand movies and games, complimentary toiletries, mini fridge and internet access. 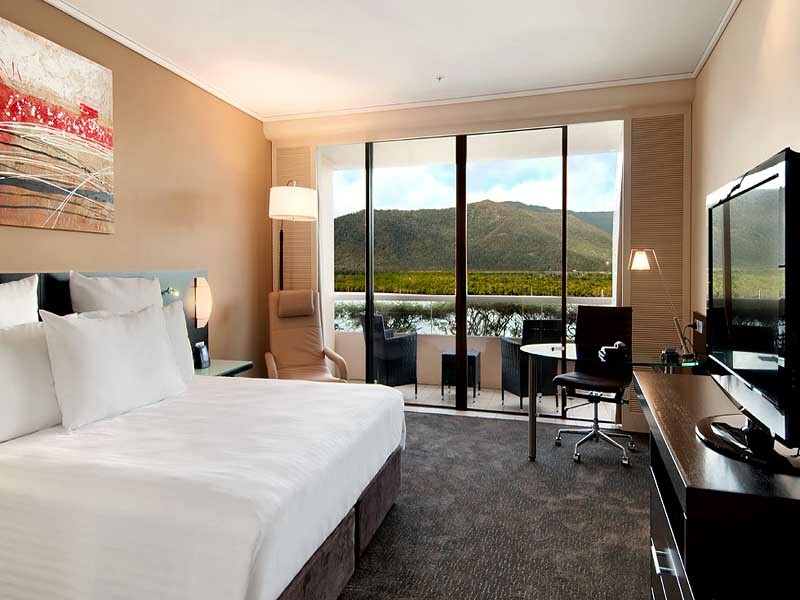 Take in the gorgeous views of the Cairns cityscape, the mountains and the rainforest from the Hilton Deluxe Rooms. The balconies are accessible via a wide angle door meaning your stunning view can be seen inside too. Choose your bedding configuration and make the most of modern amenities such as air conditioning, bathrobe, TV with on-demand movies and games, complimentary toiletries and internet access. Relax in your very own hydro bath with a cold iced tea when you stay in a Hilton Spa Room! These air conditioned rooms are complete with a range of modern amenities such as internet access, TV with on demand movies and games, complimentary toiletries, mini bar and more. Step out onto the furnished private balcony for incredible views of the Cairns cityscape, the mountains and the rainforest. Stay in total luxury in a Hilton Executive Room. Perfect for a business traveller, these air-conditioned rooms are complete with modern features such as a work desk with an ergonomic chair, Wi-Fi, 37” TV with on-demand movies and a mini bar. A bonus feature of the Hilton Executive Rooms is the access to the Executive Lounge where you can enjoy a complimentary breakfast. The rooms also feature a private balcony for you to relax and take in the stunning city and mountain views. Situated on the Esplanade of Cairns is where you will find Hilton Cairns. 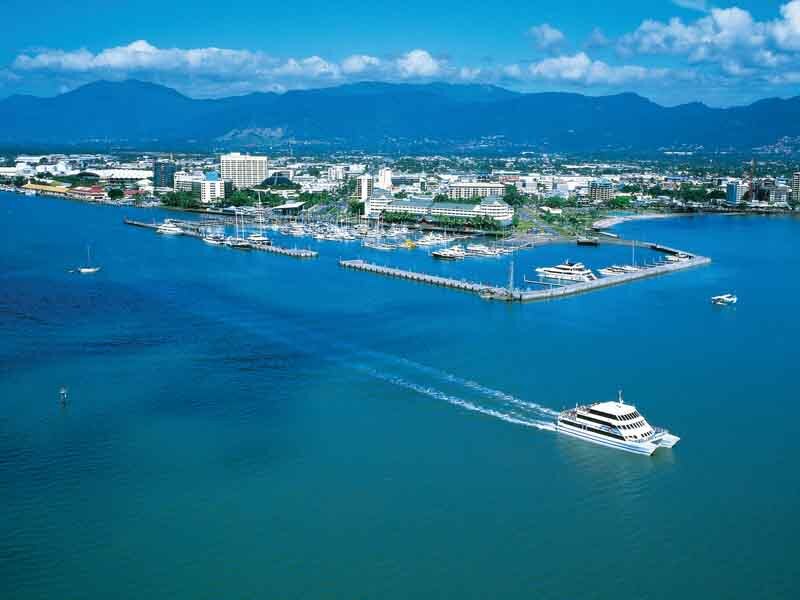 The hotel is located on the waterfront and is only a short walk to the best of Cairns dining and shopping. The Cairns Airport is only a 10 minute drive away too! When you holiday at Hilton Cairns you’ll find everything you need to make the most of your stay right in front of you. Active travellers can keep up with their fitness routine in the fully equipped gymnasium, complete a few laps in the swimming pools or head to one of the many surrounding recreational centres like Cairns Esplanade tennis and volleyball courts less than 1.5km away and Cairns Golf Course and Cannon Park Racecourse less than 7km away. Families can spend quality time together lazing around the outdoor swimming or exploring the family friendly attractions of Cairns Esplanade like cinemas, shopping, library, markets, Cairns Wildlife Dome, Reef Fleet Terminal and parklands all within 2km. If you’re a traveller that likes to immerse in the cultural of your destination, visit the friendly team at the Tour Desk of Hilton Cairns to organise a range of different tours or venture within a few kilometres of the hotel and find Cairns Museum, Cairns Centre of Contemporary Arts and Cairns Regional Gallery. Just want to unwind and relax? Spend your holiday with the acclaimed beauty therapists of Aiga Spa Cairns inside the resort and indulge in a range of relaxing Japanese-inspired treatments in a tranquil setting. I love the location with immediate access to the waterfront and lovely views from so many of the rooms. The hotel layout is open so it always feels pleasant there. The rooms are always beautifully clean and comfortable and have their own balconies for sitting out and enjoying the day with a drink and a book. I have always found the staff incredibly pleasant and helpful, and the service impeccable.